“A state of the art Class 5 softswitch and world-class redundant colocation facilities with 24/7/365 monitoring ensures that our customers can focus on conducting their business.” That’s a lot of buzzwords and geek speak, but it’s pretty easy to translate: they have a lot of features, and they’re reliable. But what Improcom really offers may surprise you. 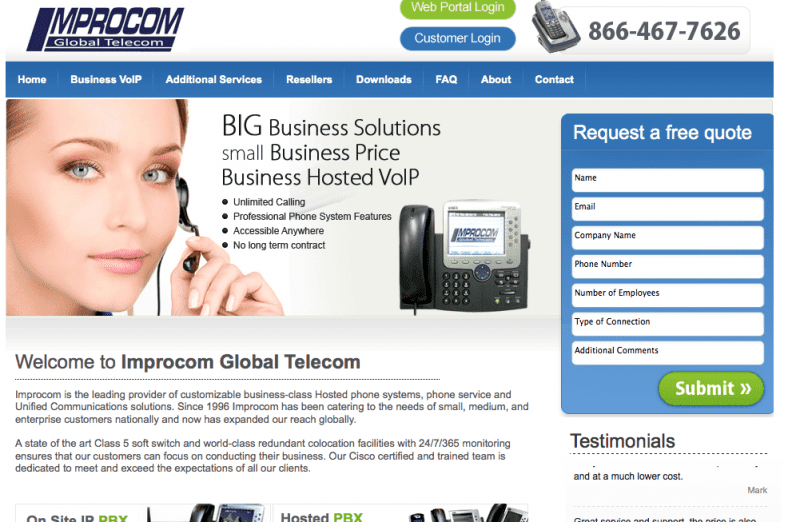 Improcom provides both hosted and hybrid PBX solutions. They are one of the few companies I’ve reviewed so far that actually sells On-site PBX hardware. 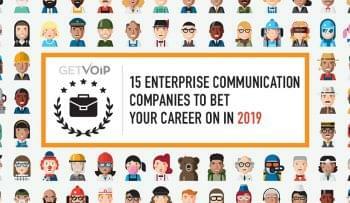 They offer a range of Cisco “Unified Communications” products that, depending on the product, have as few as eight, and as many as 104 connections to IP phones. The units, which are about the size of a desktop computer, can optionally be connected to analog trunks or BRI/PRI digital trunks. It’s kind of fascinating to read features such as “music on hold” and “automated attendant” as being attributed to an actual piece of machinery. But that’s how it all works. They all run on these machines. Improcom gives you the option of having them on your site rather than in a center far away. You also, of course, have the option of going for all-out hosted IP-PBX, and at very reasonable rates starting at only 20 bucks a month. The web site is rather Spartan in design, and merely mentions “an abundant set of features.” If you’ve read any of our review pages, you know what 30 or 40 features to expect, but it’s odd to only have a few lines at the bottom of a page dedicated to them. Even if you’ve heard the same song before, it’s nice to hear it. Maybe their marketing team decided it was better to explain what the features were once a potential customer set up a consultation, or maybe, their ideal customer is someone like me, who knows what to expect. Improcom has the business credibility to back that up. Improcom is a member of the Better Business Bureau, and a member of the Brooklyn Chamber of Commerce. But equally important is their Cisco certification. Cisco is at the top tier of network hardware, and a Cisco certification is the mark of high quality IT professionals. 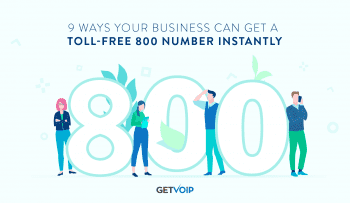 Improcom, in addition to their business VoIP services, also offers a number of on-site IT services, including setting up and maintaining cabling, installing T-1 lines, and other types of network management. As a counterbalance to Improcom’s Spartan web site design, it’s very easy to understand their prices. They have a “quote builder” page, which couldn’t be easier to understand. The quote builder page has simple click boxes that check off which feature set you want, and what phone. The tab at the top tallies it up. For example, unlimited in/out calling is $29.95. Just like that. Let’s say you only want an internal network, and don’t even want to make inbound or outbound calls. Click the box for “extension dialing only” and you’re set. There are also about a half a dozen additional features, such as local and toll free number, and auto attendant. Improcom offers live receptionist software, which not every provider does. The web site has, as I said, a Spartan design, and most providers that have a basic design, like CallCentric and eVoice, sell numbers and metered minutes. Improcom has both metered and unmetered plans. Like CallCentric, OnSIP, and eVoice, Improcom offers a tailored package. The no-frills web site makes it very easy to understand what you are and aren’t getting, from feature sets to multiple IP phones. After searching through the labyrinthine websites of 8×8 and RingCentral, it’s very refreshing.